Help us celebrate our 100th day of School on February 8, 2018! 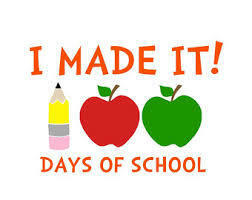 Students are encouraged to help us celebrate our 100th day of school by wearing a t-shirt marking the 100th day of school! If you choose, 100 items can either be drawn, painted or securely attached to the t-shirt. Please make sure that the items used to decorate the t-shirt are safe, such as buttons, bows or t-shirt paint. Students who participate by wearing their “100 day of School t-shirt” will receive a Popsicle with their lunch on February, 8th.